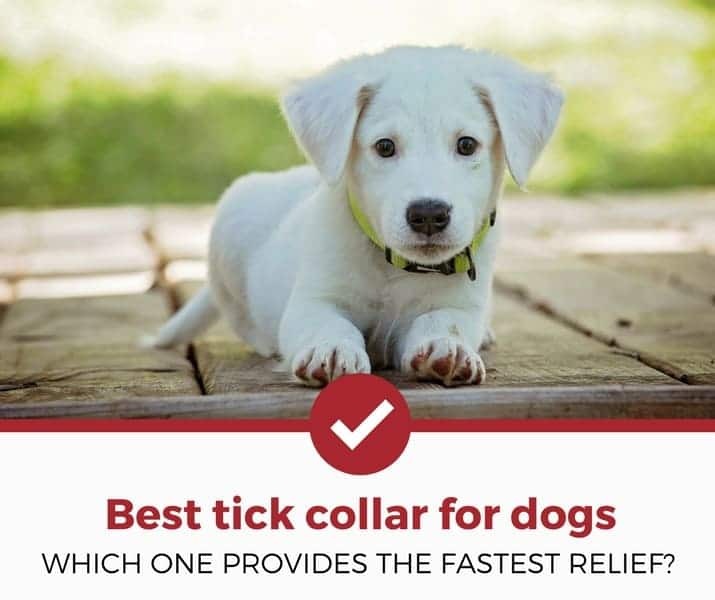 Looking for the best tick collar for dogs in 2019? Then you're in the right place! Out of the the different tick collars in this review, we have to give the nod to the Seresto collars once again mainly because they just work. Although pricey, it has been tested, tested, and tested again as THE go to collar choice for pet owners. There are 3 variations of collars. One of large dogs, medium sized dogs, and small dogs. The size of the dog matters due to the chemicals used in the collar. Big dogs have a different body composition and have higher tolerances for the chemicals used. Smaller dogs need less chemicals for tick killing success. Please remember however, tick collars are not always 100% effective and it's still possible to occasionally find a tick on your pet's coat. However, the consistent use of a collar is an important part of preventative pest control for your pet and can keep them healthier in the long run. We've broken down three other tick collars for your pup down below. If you're curious and you've got a second, give our guide a read! Want to skip all this research and just hire a decent exterminator for your tick problem? What Is a Tick Collar? What Makes a Tick Collar Top-Notch? Do Dog Tick Collars Work (Really)? Short on time? Take a look below for the top 4 in our list (in order of preference). Otherwise, check out our buying guide. While the name suggests that this may be a fancy necklace for ticks, this product is actually designed to be worn by dogs. Its mission: protect against these pesky parasites. Each collar is outfitted with an active ingredient which is slowly released over time to work against the ticks. These pesticides, oils, or other ingredients inside the collar will repel or even kill any ticks that might eye the dog wearing it—preventing your canine companion from being its next meal. How Does A Tick Collar Repel Ticks? Tick collars work mainly by releasing pesticides or oils which work to kill ticks on contact. Some products also mask the natural smell of the dog so that ticks aren't attracted to it as a host. Over time, the collar releases a new supply of its active ingredient, keeping your dog protected for months on end. Some examples of active ingredients are permethrins, pyrethroids, or regular plant oils. Permethrins and pyrethroids are pesticides derived from chrysanthemum flowers. They disrupt the nervous system of pests like ticks and fleas and eventually cause death. The amount of pesticides in a tick collar is not dangerous for the dog wearing it. In fact, most dogs are more annoyed by the sudden appearance of a collar around their necks than the pesticides released from it! For an in-depth look at how the collars work, take a quick look at the video below, which outlines how the Bayer Seresto Tick Collar gets the job done. How Long Does One Collar Last? A standard tick collar lasts between 6-8 months. Some expensive brands claim to last up to a year, while it's also possible to purchase cheap collars which are only good for a month or two. Most products are not meant to last during the winter months when there are few ticks outside. However, it's still a good idea for your dog to have a tick collar since cold weather or winter does not typically kill ticks. What Are the Risks of a Tick Collar? In general, tick collars are a safe investment...but they do come with some risks. If your dog doesn't react well to a collar, remove it immediately, take your pet to the vet, and try a different model following the recommendation of a professional. The benefits of using a tick collar far outweigh the risks, however, because of the numerous diseases spread by ticks. In addition, the collars largely do not make your dog uncomfortable. All in all, tick collars for dogs are viewed as safe, effective, and affordable methods to combat ticks while not limiting your canine companion in any way. Tick collars tend to share a few significant characteristics because, at their core, they all have the same function and design. There are, however, two key players in the game of determining whether or not a tick collar is good: efficiency and comfort. A collar is only useful when it is capable of keeping ticks from biting dogs, period. It could be the most stylish ring in the world and have all sorts of built-in features, but none of those matter as much as keeping your pet free from irritating tick bites and the dangerous illnesses caused by these parasites such as Lyme disease. Pet owners truly want their dogs to be happy and comfortable, bottom line. And, by the same token, no dog wants to have to wear a collar like one of those plastic rings that holds soda cans together. When picking out a tick collar, remember to measure the circumference of your pet's neck, then order a size which will leave them with some wiggle room. You don't want it so loose that it will fall off, but you don't want the material to dig into the skin, either. In general, tick collars work and are an excellent way to provide long lasting treatment without the constant reapplication of medicine. Each pet reacts differently to the materials involved, so sometimes you might need to try several different products before finding the best one for your canine companion. 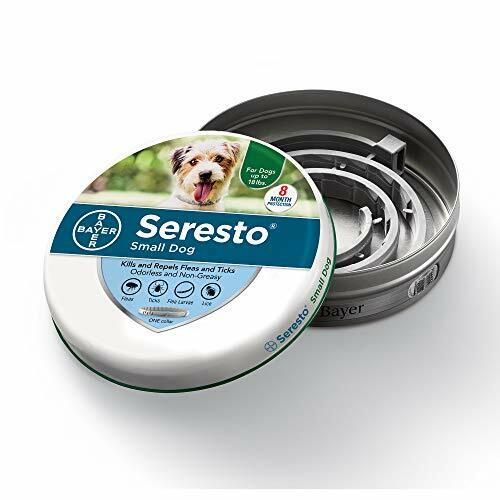 The Bayer Seresto Flea and Tick Collar is one of the most well-known brands in the industry. This collar uses pesticides which are slowly reapplied throughout the months to the dog's coat to stop ticks in their tracks. Bayer sells collars in different sizes for dogs of varying weights, so there is always a collar to fit each pet. The collars vary in price (getting more expensive for larger dogs), but each collar offers unmatched, name-brand protection for up to 8 months. Unlike some models, this collar doesn't give off an odor. The product is easy to size and fits snugly around the dog's neck, ensuring adequate protection without choking your pet. 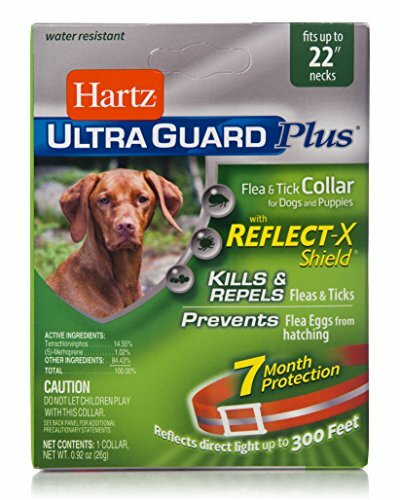 We recommend this product to someone who wants almost guaranteed protection for their pets against fleas and ticks. This collar is also popular because of how long it lasts, so it can be seen as more of an investment rather than a hit to the wallet. Hartz is another brand that's been around for a while. 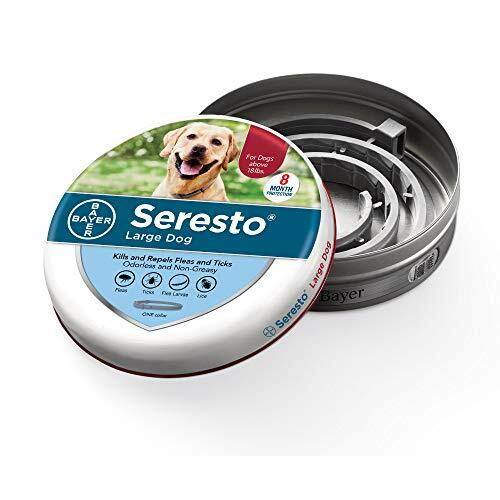 Although not as well received as the top tier Seresto brand, Hartz produces and affordable product that can provide decent flea relief for your pup. The active ingredients include Tetrachlorvinphos (14%) and (S)-Methoprene (1%). S-methoprene is a popular IGR, which servers to interuprt the flea life cycle. We like it for folks who need to watch their budget. 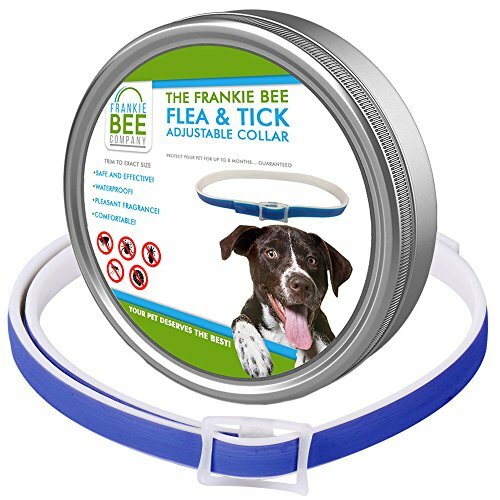 The Frankie Bee Company collar is popular among people who want to protect their pets without using pesticides or potentially irritating chemicals. This collar is one-size-fits-all and is easy to customize to fit around any dog's neck—from heavyweight German Shepherds or tiny chihuahuas. It's also water-resistant, so the product won't lose effectiveness if it rains. Like many other collars, the Frankie Bee Company model slowly releases its protective coating over time and can last up to 8 months. What sets this collar apart is that it can be worn by cats and dogs. Normally, tick collars are limited to use by dogs only and will harm any cats which come into contact with them. The Frankie Bee Company, though, has side-stepped this dilemma and created a product with versatility in mind, which is something we can't recommend highly enough. We endorse this product to people who want to keep their dog safe from fleas, ticks, and mosquitoes while using a product which won't irritate their furry friends. This product is an essential oil based collar designed to fit around the necks of all dogs. It is completely adjustable, which means it gives your pet extra room to breathe. This collar claims to be free of allergens as well as pesticides which can cause skin sores, irritation, and redness. The collars offer waterproof protection against parasitic pests on your dog, and can protect against young and old fleas and ticks for up to 5 months. We recommend this collar to individuals who own sensitive dogs with allergies, or who frequently have skin conditions. 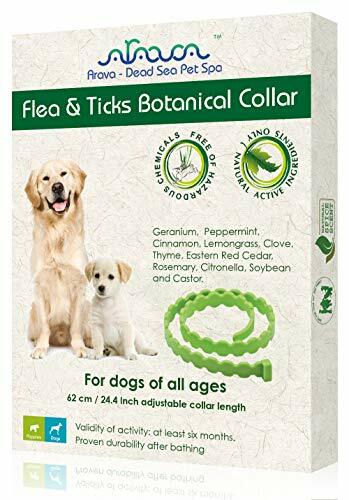 This is a relatively inexpensive tick collar, which is ideal for those who need to protect their dog from bites, but don't want to break the bank in doing so. Most people have the same basic needs when it comes to a tick collar for their dogs: they want the collar to be safe, comfortable, and effective. While all of the products reviewed here pass these requirements, our personal favorite is the Bayer Seresto Tick Collar. Curious about other tick related products? Check out our other detailed guides to help you deal with your and your pet's pest problems.